This gallery walk allows participants to explore the history of education and race in Mississippi. Using textbook excerpts, data, quotes, legislation, and images, the gallery walk begins in pre-Mississippi in the ancient city of Timbuktu, moves through Reconstruction and Jim Crow, and carries on to present day issues such as Initiative 42. Gallery walks are often used to introduce participants to new content or delve deeper into information already covered. The activity calls for participants to walk around the given space and comment on images/text about the respective topic. Participants can be invited to add their own experiences. By the 16th century, Timbuktu was home to three universities and 150 schools. Do we choose our history? What is the significance of a monument? It would be interesting for students to compare old textbooks with their current ones or primary sources. This is an old Black schoolhouse near my home. I wonder if any are preserved or if you are able to take students to see. If we don’t inform these students and try to make changes, history will repeat itself. The teacher or facilitator first selects images and texts that tell a story about the respective topic. Once images/texts have been chosen, they are placed throughout the room evenly to avoid congestion in one area. They can be placed on walls on their own or attached to chart paper for participants to write on. 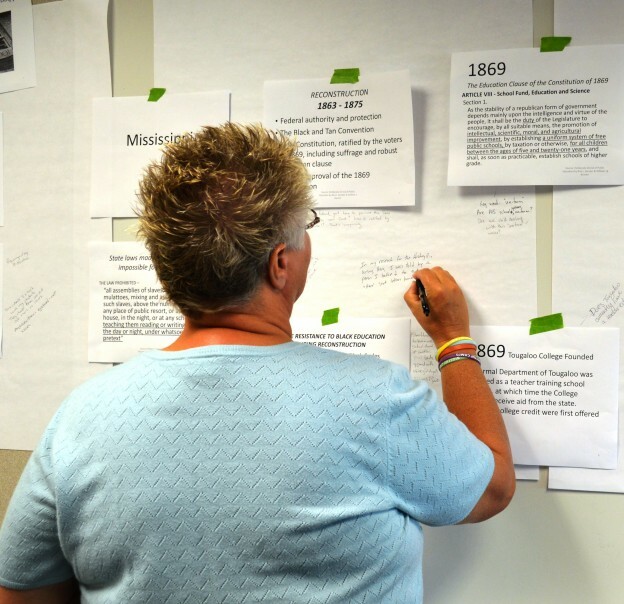 When the images are ready, participants are instructed to either write comments on a post-it note and place it next to the image/text, or write on a piece of chart paper under the image. A question can be posed at the beginning of the gallery walk to focus participants on a specific aspect of the content. For example, “As you are walking around, think about present day examples of segregation in education.” Participants are asked to walk around the space as though they were at an art gallery. There is no talking during the gallery walk. This gives participants a change to reflect silently. Give participants 10-15 minutes to write down their thoughts. Allow more time if necessary. Once the group reconvenes, ask a few follow-up questions about the experience and what was learned. One option is to have students talk in small groups about what they observed and wrote and have each group share their findings. Here are the two primary resources used for the gallery walk on race and education in Mississippi. Other sources are indicated on the respective pages.